VENTURA, Calif. - March 25, 2019 - PRLog -- A clear plexiglass PODS container will be onsite with Academy of Country Music Award winning on air talent Dave Daniels, who will broadcast KHAY live from inside the container to bring attention to a fun giveaway with Country music's most popular music festival. Local moving and storage expert Steve Yapp and his team who help over 60 charities across Ventura County, will bring the plexiglass container to not only support the promotion but also serve as an onsite studio. Listeners will have three chances to win. 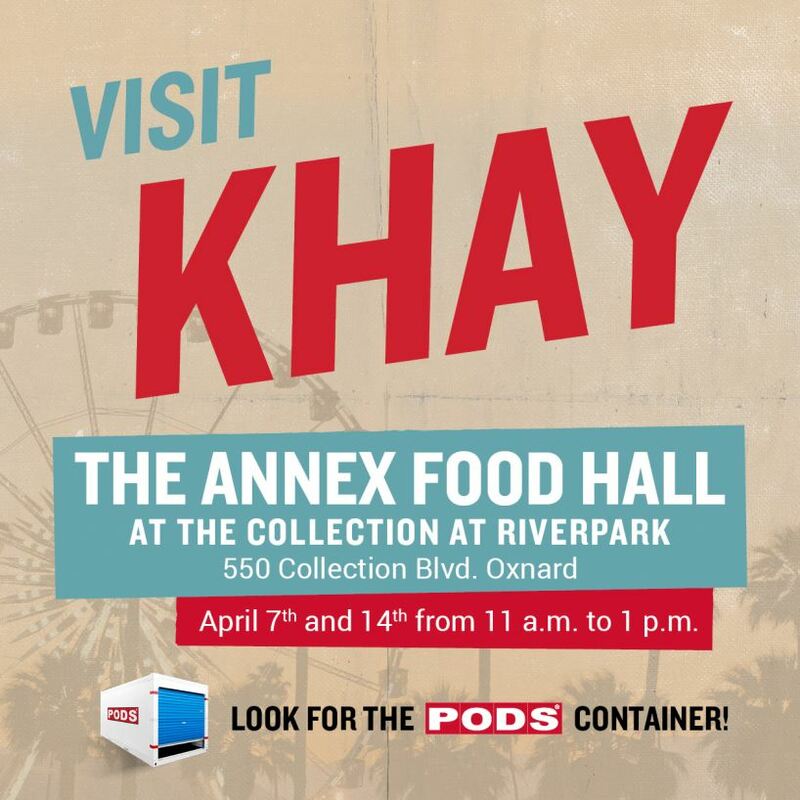 On March 25th at the KHAY PODS studio from 6 a.m. to 9 a.m. at 1376 Walters Street, and then on April 7 and April 14 from 11 a.m.-1 p.m., residents are asked to visit KHAY at The Annex Food Hall at 550 Collection Blvd, inside the Collection at Riverpark to also be in the running for a number of tickets. Other prizes will be available, including up to $500 in The Annex Food Hall gift cards. "Over the three events, KHAY will give away 12 pairs of tickets for a truly once in a lifetime experience and we can't wait to give people the chance to experience it," states Steve Yapp, owner of local PODS moving and storage. o Monday March 25, 6 a.m.-9 a.m.
• The Annex Food Hall at The Collection at Riverpark, 550 Collection Blvd, Oxnard. o Sunday April 7th, 11:00a.m. - 1:00p.m. o Sunday April 14th, 11:00a.m. - 1:00p.m. "We invite you to come out. This is an opportunity to meet the KHAY team, experience great food at The Annex Food Hall and win some great prizes," said Yapp. Steve Yapp is the owner of three Tri-Counties PODS franchises that serve residents and businesses in Ventura, Santa Barbara and San Luis Obispo Counties. Dedicated to the local community, Yapp's franchises have donated hundreds of PODS containers to nonprofit and charitable organizations throughout Ventura, Santa Barbara, San Luis Obispo, San Diego and Los Angeles counties since opening their doors in 2005. A partial list of recipients include: Boys & Girls Clubs, FOOD Share of Ventura County, Casa Pacifica, Toys 4 Tots, California Strawberry Festival, Ojai Music Festival, Relay for Life, C.H.P. Holiday Toy Drive, Salvation Army, Santa Maria Good Samaritan, Oxnard Downtown Management District, Boy Scouts of Ventura County, California Visitors Center, Simi Valley Days, the Oxnard Salsa Festival, and Catholic Charities. PODS® offers moving and storage the way you need it done, with unlimited time, space, and control. When PODS pioneered portable storage in 1998, they introduced the world to a brand new, flexible way to move and store. Now an industry leader, PODS currently provides residential and commercial services in 47 U.S. states, Canada, Australia, and the UK. To date, the PODS network has completed more than 900,000 long-distance moves, has nearly 4 million deliveries, and has over 200,000 PODS containers in service. For more information, go to: www.mylocalpods.com.